A new analysis of SpaceX’s plans to have revenues of $30 billion per year for its global satellite Internet project is “too optimistic” and could damage the industry’s credibility by creating unrealistic expectations. It also claims that SpaceX CEO Elon Musk has repeatedly manipulated financial analysts with “totally unrealistic” schedules and projections. WSJ’s [Wall Street Journal’s] article notes that SpaceX expects to attract over 40 M subscribers by 2025. The largest satellite Internet network today is operated by HughesNet, which has slightly above 1M subs after nearly a decade of operation. Combining ViaSat’s Exede and HughesNet, the year with the highest number of new subscribers was in the 300-350,000 range, which hints at how difficult it is to build the distribution channels for this kind of service. Of course, cheap, self-installation terminals and a global operation infrastructure could accelerate service take-up, but it appears very difficult to reach the 40M installed base in just 5 years. Compounding all of the above, one must not forget regulatory barriers as SpaceX would need to pursue landing rights in each and every country it wants to operate…. The best way to predict the future is building it, and NSR will only be pleased to see the satellite industry growing to the levels forecasted by SpaceX, as it would be beneficial for everyone. While it is true that forecasting revenues for such innovative ventures has a significant level of uncertainty, NSR nonetheless believes the $30 billion revenue projection is too optimistic no matter what assumptions are made and could stoke unrealistic expectations undermining the industry’s credibility. One must also consider that SpaceX are masters of strategic communications and have repeatedly made extravagant announcements to push analysts, the financial community, the industry and employees in its favor. It is its CEO managing style, the day after he announced a totally unrealistic schedule and sales target for Tesla’s Model 3, auto analysts universally moved their own estimates up satisfying what probably was the original goal, shifting the paradigm. SpaceX has said very clearly that it plans a step deployment of the constellation starting commercial operations with a “modest” 800 satellite constellation (compared with the 4,420 of the full deployment), which hints at the venture having different growth scenarios with more reasonable assumptions. When analyzing SpaceX projections, being an investor, a competitor or an industry watcher, one must keep its independence and not fall in this expectations trap. Otherwise, industry’s credibility would be at risk. Right on James G. These are the same people that said that SpaceX & Musk “didn’t know what they didn’t know.” The same established industry that tried to keep electric vehicles from being mass manufactured. It’s just too bad for your readers that you are regurgitating a paid shill hit piece by a crank Andy Pasztor, who lives down there in the sewer along with Loren Grush. Better yourself Doug. How did their previous predictions commercial space work out? Has SpaceX folded yet? Did SLS fly by December 31, 2016 as mandated by law? The global mobile backhaul market is forecast to be about $33B by 2020, with a CAGR of somewhere in the 7% range, which would make it about $42B by 2025. The global market for satellite consumer services in 2015 was $98B for TV, $5B for radio, and $2B for broadband. I think there’s an excellent possibility that satellite could capture the majority of the new mobile backhaul build-outs by 2020, and SpaceX could probably capture two-thirds of that if they execute. That would be about $6B by 2025. If things go just right, this would lead to a boost in 5G bandwidth rollout and change the economics of deploying cells more densely. That might get SpaceX to $8B/yr in backhaul by 2025. The big, big question, though, is this: What if the broadcast TV market collapses? We seem to be getting near the knee in the curve for cord-cutting, and the GEO constellations for broadcast TV relay could find themselves with a rapidly declining market share. What happens then? One possibility is obviously that the GEO constellations start soaking up a lot of content distribution network traffic. It’s not very latency-sensitive, and the dedicated channel structures used by broadcast could probably be reconfigured for more generic content data. But they’re got huge ground spot sizes and the uplink/downlink equipment is expensive. I’d say that there was a pretty good chance that a fair chunk of the expansion of CDN traffic could wind up in low-orbit constellations that were more flexible and cheaper to access. Let’s take a third of the $98B currently allocated to TV and feed it into generic content distribution. Then let’s allocate half of that to low-orbit systems, and give SpaceX two-thirds of that. That’s about $11B. This is just pure dumb transit. If SpaceX were to decide to go into the CDN business itself, that could be even higher value. I’d also allocate at least $2B to VPN services. Companies will pay a lot to have their VPN traffic able to be more flexible, which is hard to do with terrestrial networks, but might be pretty easy in a satellite network that’s dense enough. So now we’re up to $21B without even touch the direct subscriber broadband market. If we figure that that can support a $75/month price point and we accept two-thirds of the 300K/year sub growth, we’d be looking at 1M subs by 2025, which would yield about $900M a year. Let’s call the whole thing $22B/year. It’s not $30B, but it’s a pretty hefty chunk of business. Mind you, this is pretty optimistic. But it’s not totally unrealistic, either. Filing that under… Things founders say to get new financing. I think you’re analysis shows insight into the satellite telecom industry that I don’t have (and may never have for that matter). But I would like to ask a few questions and get your feedback. You’re bringing up bulk data as a big portion of SpaceX’s data. Won’t that data be bought/sold at wholesale rates, rates that will likely be depressed with existing capacity? What happens if any of the other mega-constellations come online (OneWeb or Boeing)? Isn’t the only really profitable market in direct consumer sales? Wouldn’t that imply SpaceX wants to be largest combo Isp/cell provider on the planet (size by reach, not necessarily market share)? Dose that seem rational? If so, why only charge $75/month? I actually DO expect a space-based internet, but is a SpaceX near-monopoly a reasonable expectation? Won’t existing fiber/cell networks still provide serious competition (with amortized costs) in the highest density (and thus most profitable markets)? The growth in total internet throughput has been a pretty reliable. Cisco’s forecasting total internet traffic to be at 194 exabytes per month in 2020, with a CAGR of 22%. That’d be 529 EB/mo in 2025. That would about 1.6B Mbps as a crude average bandwidth. Current transit prices vary based on how much bandwidth you buy, but they were about $2.00/Mbps/mo in 150 Mbps increments fairly recently (as low as $0.63 in very large increments, but let’s assume that SpaceX’s market will be customers with a pretty high fan-out), with about a 33% decline per year. That would make them about $0.036/Mbps/mo in 2025. So the total transit market is 1.6B * 0.036 * 12 = $691M. It’s unreasonable to assume that SpaceX would get more than 25% of that market, so we’d be looking at $173M/yr in 2025. That doesn’t look so good. Now, notice that we’ve used a completely different methodology here, where we assume that everything is transit, end of story, full stop. In reality, backhaul really isn’t transit, nor is content distribution, nor is consumer service. So a 3.6¢/Mbps/mo number is probably way too low. But let’s work backwards, and assume that 10% of all the bits floating through the internet go through SpaceX. How much would those bits have to cost on average to get SpaceX to $21B/year? $21Byr / 1.6B Mbps / 12 = $1.09/Mbps/mo. That number’s… not completely unreasonable. Mobile data, when you account for actual usage, runs between $2-$4/Mbps/mo right now. Mobile’s not a very good proxy for average internet cost right now, but it will become a better and better one as time goes on. Still, expecting only a 50% drop in cost per Mbps over the next 10 years seems kinda crazy. Even if it only (only!) drops by 90%, you’d be looking at 30¢/Mbps/mo, which would leave SpaceX–even under the incredibly optimistic “we touch 10% of the whole internet” assumption–at no more than about $7B/year. Based on this, I’m prepared to withdraw my optimistic back-of-napkin. That $7B/yr ain’t chicken feed, but it’s off by at least a factor of 6 from what Elon’s promising. I think it’s highly likely that this is a winner-take-all market. Somebody’s going to be operating a unified constellation after buying out the competition. There’s been a lot of discussion about whether the internet gets flatter as it matures, with less transit, fewer CDNs, and a lot more free peering. If that’s the case, then yes, all the money is, almost by definition, in end-system connections (slightly different than pure consumer, because it includes enterprise traffic, too, but close enough). 1) Even if that’s how it ends up, that doesn’t mean that there isn’t a decent business in transit, CDN, and backhaul in the early days of the network. Early cash flow makes high-capitalization projects a lot more feasible. 2) Note that our second methodology pretty much takes into account an average consumer cost, so the $7B/yr number will probably hold up. It’s a mistake to assume that high density = most profit. It certainly won’t be true in the developing world, and isn’t true today in the rural US. If you want broadband access outside of DSL range in the country, you pay through the nose for it. I would expect that trend to continue. IDK why you are that negative. The analysis linked here is pretty professional – even highly professional for a free website. If you feel you want to take on all or one of the points (the analysis mentions a number of assumptions they find unrealistic) go ahead. Otherwise it is plain badmouthing. As a person who is NOT a member of the church of Elon, I do agree that the core competence of Mr. Musk is PR, and that his statements need to be taken with a bucket of salt. Andy Pazstor and Loren Grush are WELL KNOWN paid crank corporate shills for the defense industry. If you haven’t been around long enough to figure that out, that’s entirely your problem, and not mine. I will bad mouth them every time they do this, and they both have a LONG HISTORY of this kind of paid shilling for hire for the industry. IDK. There is a number of valid points of this analysis which you didn’t address but I find one crucial: there is no $30 bn market for the data transfer in the proposed price range, and certainly not in 2025 knowing of 4G/5G developments globally and other competition available. BTW 75/month + taxes for Internet is A LOT (and certainly for lousy Internet). When you live in US you got used to American monopolistic crazy prices but I can assure you, there are huge margins that can be dropped when needed. I am writing from a flat with a cable with a healthy dose of channels, VOD, DVR, WiFi router, 2 TV points and a 100/10 Internet where I pay for all of that less than 20 USD per month after tax. This is the difference. You can have here a decent basic LTE service for less than 10 usd / mo. In many parts of the world 100 USD per Mbps is not an option, even if we make some sharing. And within 8 years I see only dropping prices. And the places with no LTE/WiMax/WDMA/cable/… coverage in 2025? They don’t have it because there was no market or the local govt did not want it. Soo, unless I see a service convincing many millions of scattered and often poor people to pay hundreds of bucks per year for a very basic Internet, I remain skeptical. I agree. Musk’s M.O. is to come up with the most optimistic plans and revenue projections possible and assume that nothing could or will go wrong. Then he ends up struggling to make good on his promises. There is ample and verifiable evidence of that. The satellite Internet is more of the same. Neither of the people Tommy mentions wrote the main story or the story that it linked to. So he’s going to throw out Andy and Loren every time there’s a criticism of Musk, there will be an utterly useless series of discussion here. Can’t deal with the specific issues, so you set up and knock down strawmen. Part of it was that SpaceX was under fire not long ago for blowing up multiple boosters and delaying flights and falling behind on Crew Dragon and letting other things preoccupy them. So, the message was that satellite Internet and the Mars work was only taking up a small percentage of SpaceX’s resources and money. Of course, when you’re pitching to investors, your timelines and revenue projections are going to seem a lot more optimistic. Especially when you have someone like Musk who is obsessed with finding a way to fund his Mars obsession. That is what all these schemes are really after, not extending the existing sat telecom paradigm (ack! I said paradigm! ), but creating a new environment where a cheap (Android no doubt) smartphoneish whateverNet handset and distribute (maybe for free) it to the unwashed masses. They aren’t going to charge the end user in Nowhereistan (at least at first), they are going to charge the content providers for the privilege of reaching those markets, not to mention data-mining all those brave new worlds. 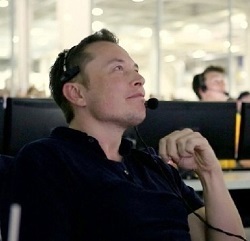 He says unbelievable things, but he achieves unbelievable things too, “s***elonachieved”. He takes advantage of his track record to paint a fantastic future, one cannot be sure that it is impossible with him. But I don’t think he’s interested in making money per se, so investors just looking for a return should maybe be worried. Elon Musk just wants to go to Mars. He wants the technology and infrastructure of commsats (at Mars), not its monetary profits. Your point about the SpaceX broadband constellation’s potential to gut existing content distribution networks is spot-on. And I think just looking at other satellite-based CDN systems is too limited a perspective. Even more vulnerable will be terrestrial cable TV systems, most of which are now monopolies in their service areas. Musk used to be heavily criticized because what he was planning to do was either flatly “impossible” or – the more nuanced version – “Impossible to do as cheaply as he says.” Except from the most extreme fever swamp Never-Musk-ers, you don’t really see much of that sort of thing anymore. The only criticism of Musk with some validity is the one to the effect that he’s always late when he finally delivers one of his “impossibilities.” The paradigmatic “late thing” is Falcon Heavy. If it flies this year, it’ll be about four years late. So suppose we tack four years onto SpaceX’s year-old internally projected revenue schedule for its broadband constellation project. Maybe the thing won’t pull in $30 billion annually until, say 2029. Maybe SpaceX won’t put people on Mars until 2029 either. That makes Elon Musk over-optimistic, not a fraud. Contra Mr. Maelstrom, the core competence of Elon Musk is doing the “impossible” on a budget. Well, the terrestrial guys already have the satellite TV people to contend with. The big difference, I think, is that people like Dish and DirecTV are pretty much just MSOs in the sky, subject to the same channel bundling agreements as the terrestrial guys. The things that can eat away at their business model are streaming and IPTV–both of which fit better with lower-orbit mesh constellations than the single-relay model used by GEO sats. It’s an open question whether the GEO operators could adapt to be decent CDN carriers instead of just firing DVB at the ground, like they’re doing now. I’m thinking not, if for no other reason than the places where they’d be able to do that without building out pretty big regional terrestrial networks are high-density population centers, where the incumbent CDNs can scale very easily. The new money is in the less-dense areas and the developing world. Low-orbit constellations are going to be vastly more competitive there. That said, see my second back-of-napkin based just on internet growth and cost trends, which makes the LEO satellite internet biz look kinda marginal. The truth probably lies somewhere between doing extrapolations off of the existing sat biz and extrapolations off of the existing (largely) terrestrial biz. After waving my arms at this for a bit, my guess is that SpaceX is a lot more likely to be closer to $15B than they are to $30B by 2025. But that’s not exactly chump change. Did you read the analysis? It tackled this issue, the numbers don’t add up. Regarding your claim about “Nowhereistans”, if you do the research you will see that the largest such a market is called ” United Nowhereistans of America”, that is US interior – where the telco prices are high and a quality of service is third world. People in other countries, as you realized, already have cellphones. Which means that the infrastructure, including BTEs, regulation and sales channel is in place. And I can assure you, these people pay much less and building the infrastructure with cellular networks will be far, far cheaper. Utilization of this network and making some real money requires a very novel business model – which has not been presented. Otherwise other techs simply beat them regarding Mbps per $. And if you have a customers’ saturation to get 30 bln USD per year, you can build cell towers as well. Which are better. But (even assuming it is realistic for say 5 years) would 15 bln USD provide enough inflow to make it profitable? And the second issue: you use SATs because revenue stream from a square kilometer is too low to invest in a different technology in the region. With possible revenues of 30 bin (or 15 bln) you may utilize even 100 bln USD for investment. With these money in 2025 you can flood GEO, build hundreds of DVB-T masts and drown many countries in BTEs – and you will be able to push much more Mbps. These money is more than the planned LTE infrastructure investments GLOBALLY in the next 5 years, per my snap google search. If I were to invest my money I would see much more sense in building LTE infrastructure in rising African and Asian megacities (or providing them with hardware) than trying to capture something in the lowest billion of people with my investment. The business case must be different and needs to explain why this tech and not something tens or hundreds of times cheaper per Mbps. If you have nothing but broadcast content, maybe. But GEO is terrible for internet. Round trip times are awful and spot sizes are big, which limits link efficiency. Also, the ability to do relay to anywhere on Earth makes round trip times even longer in GEO. You’re right that the capitalization of the system is going to be crucial. It’s more like $150B for a constellation of 3000 satellites, and that assumes that you can get the cost down to $50M a satellite with launch costs, which is bargain-basement. Even then, you’re probably looking at 6-7 years to break even on the investment at $30B a year, which is nervous territory for investors. Of course, if one of the investors has very deep pockets and also happens to be a zealot, that might be acceptable. But at only $15B a year, I’m not sure you can make it work. On the other hand, Elon is smarter than I am. Well, Elon might be smart (but tbh his core competence is PR and selling others’ efforts as own) – but you did not miss several promised deadlines and you did not promise more of them like a Mars trip. And he did. So, I would curb my enthusiasm and if I were to invest my money I would demand some real business plan. So far he delivered publicly only handwave. That’s why I prefer Bezos. No need to “prefer” one CEO to another–unless you’re trying to complete your “captains of industry” trading card set. Chump change it, indeed, is not. It’s plenty enough to go to Mars on, in fact. But I think the terrestrial cable vulnerability is much more in the ISP space than the CDN space. Cable companies are both. To get broadband Internet service from a cable operator, one has to also buy their basic cable TV service. Netflix, Hulu, Amazon and other new content providers/distributors have offered up a pizza-by-the-slice pricing model for streaming video rather than the fixed-monthly-fee-for-a-package-you-never-watch-95%-of model employed by the cable outfits. The latter model is extremely vulnerable to predation by a LEO constellation-based ISP that can act as a distribution medium for all digital content. If it were profit, maybe, but it’s just revenue. You have to service $100B in capital costs before you get anywhere close to profitable. I assume you mean the streamers as “the latter model”. They’re not vulnerable at all, because they’re happy to use whatever content delivery mechanism is the cheapest. Streaming, unlike more vanilla-flavored internet traffic, is pretty tolerant of high latency. So there’s a case to be made that, if GEO capacity becomes available as the MSO model fades and I no longer need to buy a package that contains a whole bunch of broadcast channels that I’ll never watch, that excess capacity can be used for content distribution for streamers. So there’s nothing particularly important about LEO from a latency standpoint. The real advantages to LEO are that it can handle vanilla-flavored internet, and its smaller spot sizes mean that there’s a lot less terrestrial content distribution to do once things land on the ground. It’s also massively more flexible in international transit–potentially even more flexible than undersea optical–and the GEO constellation is never, ever going to be able to do that. The big big big question is whether these advantages are enough to cannibalize the GEO and terrestrial distribution systems. I don’t know the answer to that. If you dropped latency and jitter (“jitter” = variation in average latency, and always gets converted to buffering latency for voice and video) down to the point where you could do away with CDN caching, you’d have a home run. But reducing jitter is a matter of massively over-engineering your capacity, and a hunk of routing capacity in space is always going to be more expensive than a hunk of routing capacity on the ground. The win for LEO sats is going to be that you need a lot fewer hunks of capacity to get to full coverage than you do on the ground. That seems kinda antagonistic to the whole idea behind CDNs, which is to reduce jitter by moving the content close to the consumer.